Following on from Scotland’s bumper year at the Toronto International Film Festival, several films are now set for UK cinema release. Sunshine on Leith, The Railway Man, Starred Up and Under the Skin all found success in Toronto with three films receiving their World premieres and one its North American premiere. These are just some of the Scottish films to make an impression on the international film scene this year. 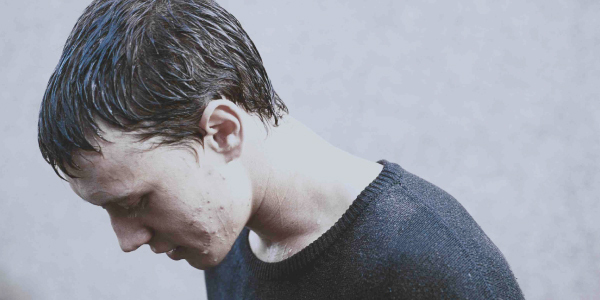 Paul Wright’s For Those in Peril debuted at the Cannes International Film Festival back in May going on to receive critical acclaim when it screened at the Edinburgh International Film Festival in June. Jon S. Baird’s Filth, the adaption of Irvine Welsh’s novel has just hosted its World premiere in Edinburgh this September and is already receiving 5* reviews, and John McKay’s Not Another Happy Ending received its World premiere at the Edinburgh International Film Festival in May. All three of these films are about to screen in UK cinemas. SUNSHINE ON LEITH is the ‘feel good film of the year’ set the songs of The Proclaimers. It received its World premiere in Toronto and its International premiere in Edinburgh in September. The film has been critically acclaimed receiving praising reviews from the Edinburgh Evening News, Screen International and The Big Issue. It’s now set to open to the nation with the film screening in UK cinemas from 4 October. Directed by Dexter Fletcher and written by Stephen Greenhorn, Sunshine on Leith stars JANE HORROCKS (Little Voice), PETER MULLAN (Trainspotting, War Horse), GEORGE MACKAY (For Those in Peril), ANTONIA THOMAS (Misfits), KEVIN GUTHRIE (Case Histories) and FREYA MAVOR (Not Another Happy Ending, Skins). Home is where the heart is for best pals Davy (Mackay) and Ally (Guthrie). Returning from duty in Afghanistan to their lifelong residence in Leith, just outside Edinburgh, the lads kindle romances old and new: Ally with Davy’s sister Liz (Mavor), and Davy with Yvonne (Thomas), his little sis’s best friend from work. Meanwhile, their parents Rab (Mullan) and Jean (Horrocks) are busy planning their 25th wedding anniversary. Everything’s going swimmingly, until a revelation from Rab’s past threatens to tear the family and all three couples apart. The film was produced by Andrew Macdonald and Allon Reich for DNA Films, and Arabella Page Croft and Kieran Parker for Black Camel Pictures. Dexter Fletcher directs from a script by Stephen Greenhorn. The Director of Photography is George Richmond. The Musical Director is Paul Englishby. FILTH, written and directed by Jon S. Baird is based on the best-selling novel by Irvine Welsh (Trainspotting) and features a stellar cast made up of JAMES MCAVOY (Atonement, The Last King of Scotland), JAMIE BELL (Billy Elliot, The Eagle), JIM BROADBENT (The Iron Lady, The Damned United), EDDIE MARSAN (Snow White and the Huntsman, War Horse), JOANNE FROGGATT (Downton Abbey, Robin Hood), KATE DICKIE (For Those in Peril, Prometheus), EMUN ELLIOT (Prometheus, Game of Thrones) and IMOGEN POOTS (Jane Eyre, Solitary Man). The film has received critical acclaim since its World premiere in Edinburgh in September with The Hollywood Reporter, Daily Record and The Guardian all praising the work of Baird and McAvoy. 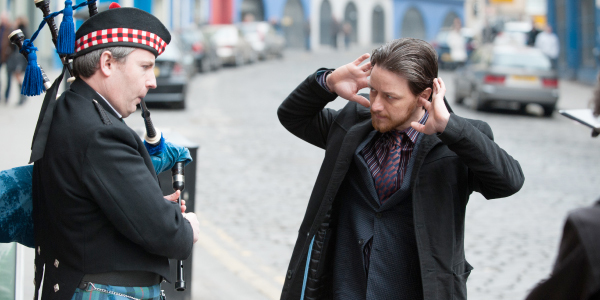 Filth is released in Scottish cinemas from 27 September and UK cinemas from 4 October. Scheming Bruce Robertson (McAvoy), a bigoted and corrupt policeman, is in line for a promotion and will stop at nothing to get what he wants. Enlisted to solve a brutal murder and threatened by the aspirations of his colleagues, including Ray Lennox (Jamie Bell), Bruce sets about ensuring their ruin, right under the nose of unwitting Chief Inspector Toal. As he turns his colleagues against one another by stealing their wives and exposing their secrets, Bruce starts to lose himself in a web of deceit that he can no longer control. His past is slowly catching up with him, and a missing wife, a crippling drug habit and suspicious colleagues start to take their toll on his sanity. The question is: can he keep his grip on reality long enough to disentangle himself from the filth? Writer and Director Jon S. Baird commented, "Filth is filled with irreverent comedy and some extremely surreal moments, but ends with a sharp twist of poignancy. The character of Bruce Robertson has to show such a wide range that it could only take an actor as talented as James McAvoy to pull it off with the necessary charm and humanity. "Bruce Robertson is not only a guilty pleasure, but a character edgier than all the other characters from Irvine Welsh's works combined. With Filth we have the chance to make a bold and outrageous film that I have no doubt will be unique, darkly funny and ultimately commercial." FOR THOSE IN PERIL was written and directed by BAFTA award-winning short filmmaker Paul Wright and produced by Mary Burke and Polly Stokes of Warp Films. The film debuted to an international audience at the Cannes International Film Festival in May before going on to receive praise from audiences and critics from its screenings at the Edinburgh International Film Festival in June. STV Entertainment, The Guardian and The Scotsman were all in admiration of the Wrights work. Paul Wright directs a superb host of acting talents with GEORGE MACKAY (Sunshine on Leith), KATE DICKIE (Filth, Prometheus), NICHOLA BURLEY (Southcliffe), MICHAEL SMILEY (The Other Boleyn Girl) and JORDAN YOUNG (Filth) all starring. Aaron (MacKay), a young misfit living in a remote Scottish fishing community, is the lone survivor of a strange fishing accident that claimed the lives of five men including his older brother. Spurred on by sea-going folklore and local superstition, the village blames Aaron for this tragedy, making him an outcast amongst his own people. Steadfastly refusing to believe that his brother has died, he sets out to recover him and the rest of men. For Those in Peril is released in UK cinemas from 4 October. NOT ANOTHER HAPPY ENDING is a romantic comedy from Scottish director John McKay, starring KAREN GILLAN (Dr Who, We Take Manhattan), STANLEY WEBER (Voilette), IAIN DE CAESTECKER (Filth, Shell), Henry Ian Cusick (Lost, The Mentalist), FREYA MAVOR (Sunshine on Leith, Skins) and KATE DICKIE (Filth, For Those in Peril) the film is produced by Claire Mundell and written by David Solomons. NAHE received its World premiere as the closing night film for the Edinburgh International Film Festival and will go on general release across the UK from 11 October. When struggling publisher Tom Duval (Weber) discovers his only successful author, Jane Lockhart (Gillan) is blocked, he knows he has to unblock her or he's finished. With her newfound success, she's become too damn happy and she can't write when she's happy. The only trouble is, the worse he makes her feel, the more he realises he's in love with her.